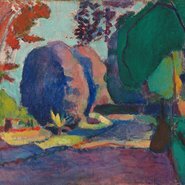 In October 1911, Henri Matisse made an historic journey to Moscow to stay with his patron Sergei Shchukin, and advise him on hanging of the radical works of modern art he had purchased in Paris. Rosamund Bartlett will tell the story of this historic visit and its impact on the young Moscow avant-garde, discussing how Shchukin fell in love with Matisse’s riotous paintings after infatuations with Monet and Gauguin, and how Matisse fell in love with Russian icons. Henri Matisse The Luxembourg Gardens c1901 (detail), The State Hermitage Museum, St Petersburg.